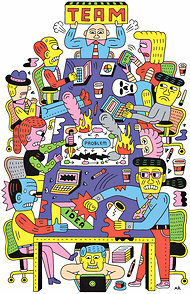 Collaboration is in, but it may not be conducive to creativity according to this opinion piece on the New York Times. The author, Susan Cain, states that solitude produces innovation and brainstorming sessions are the worst possible ways to stimulate creativity. The reason why this author states that brainstorming fials is that people in groups tend to sit back and let others do the work; they instinctively mimic others’ opinions and lose sight of their own; and, often succumb to peer pressure. Then the author talks about electronic brainstorming and communication. Marcel Proust called reading a “miracle of communication in the midst of solitude,” and that’s what the Internet is, too. It’s a place where we can be alone together — and this is precisely what gives it power. So the new GroupThink takes individual artists and thinkers to share what they know and are learning. This is a good point but I believe that being in a room collaborating on an idea is not all bad. Cain’s opinion made me think about personalized learning and why the world is moving to individuals on the other side of laptops and mobile devices are making a difference in how we learn now. Some of the loudest individuals on the Internet sit in their living rooms or at Starbucks all by themselves tweeting, blogging, curating, and doing so-called collaborating online. It’s whoever has the loudest voice, the most Twitter followers, the most hits on a post that makes a difference now. I see that each person can be an artist, inventor, and “out of box” thinker if they are given opportunities to work alone, brainstorm with others, and connect with the world online. Personalized learning is all about the learner — starting with the learner — and designing an environment that is conducive to them becoming the artist, the inventor, the writer, or whatever they are so they blossom and grow into who they are supposed to be. Universal Design in Learning (UDL) is about providing instruction and the appropriate tools to all learners so they are successful in meeting their learning goals. Personalized learning is all about the learner and starts with the learner. There seems to be some confusion about what UDL is from the perspective of personalized learning. I am very lucky to have met Kathleen McClaskey who adopted UDL principles in her professional development programs. She envisions using the UDL principles to help learners understand how they learn and how to personalize their learning. We have been doing research together on personalized learning, and I realized how much I don’t know about UDL. Kathleen has opened my eyes to Universal Design for Learning so it just seemed obvious to me to interview Kathleen as the first Thought Leader in this series. and learning. The design of the curriculum includes the three UDL principles: multiple means of representation, multiple means of action and expression and multiple means of engagement. Q2.What isn’t UDL? What are the misperceptions? UDL is often misperceived as a curriculum model for special education students only. UDL is more about designing curriculum and lessons so that the maximum of students will learn and understand. First and foremost, it is intended to support the diversity of learners in the classroom, often with the use of a variety of technologies. Q3. What are the UDL principles? To learn more about these three principles, the UDL Guidelines and the tools that can support these principles, go to The National Center for Universal Design for Learning (www.udlcenter.org/). Q4. 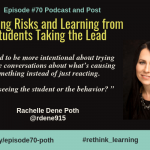 How can a teacher apply UDL principles in the classroom and for all learners? Universal design for learning is often used around curriculum, lesson design and instruction where teachers look who the learners are in their classroom and then decide how to design the lesson considering the three principles of UDL: multiple means of representation multiple means of expression and multiple means of engagement. When lessons are designed using the UDL model, the lesson includes goals, methods, materials and tools to reach and support the maximum amount of learners in the classroom. So what if we took this model and we looked at each student through the UDL lens, we could help them personalize their own learning experience? Students can use this model to help them understand how they learn best and what learning path they can take to become an independent expert learner, leveraging their natural abilities in the process. This would create a personal learning profile that is understood by both teacher and student. Q5. Can you give an example on how a teacher can personalize learning using the principles of UDL? With the understanding how his or her students learn, a teacher can then intentionally select instructional strategies and materials that will not engage the maximum number of students in the class, but provide access to the curriculum to all students. By understanding each student’s strengths, weaknesses and aptitudes/talents, teachers can design lessons that are engaging to more learners but also understand the options that can extend students expressing their understanding of any content or topic. Q6. How can a student understand how they learn best using these principles? Let’s look at the three UDL principles and how students can use these principles for them to understand how they learn. The first UDL principle is multiple means of representation. A student can ask himself/herself, “How do I like to access information including books, handouts” and “What can help me understand information that the teacher is introducing?” This self-assessment can help students examine their strengths and weaknesses in learning and understanding. The second UDL principle is multiple means of expression and action. A student can ask himself/herself, “What ways could I let my teachers know what I understand?” This self-assessment can help students look closely on ways they can best express themselves. The third UDL principle is multiple means of engagement. A student can ask himself/herself, “What am I good at?”, “What do I love to do?”, and “What interests me the most? This self-assessment can help students better understand their aptitudes, interests and overall talents. Q7. 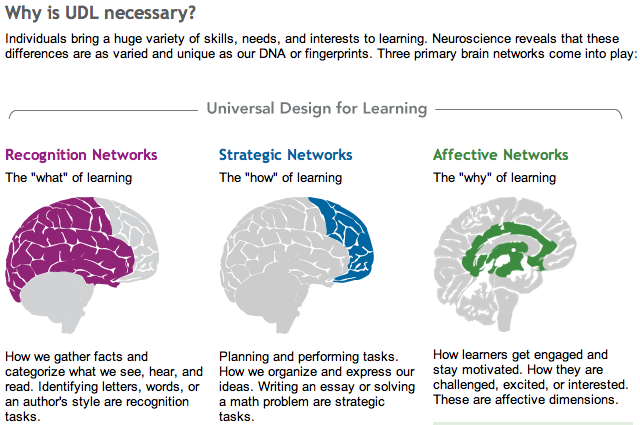 Why is UDL necessary for all learners? When any student understands how they learn, they are empowered to take ownership of their learning. This opens doors in having tools and resources that can help them become independent learners and motivated in learning, in and out of school. It also opens up windows of opportunities for learners to appreciate their aptitudes, talents and gifts and for teachers to guide and nurture them in the learning activities and projects. Kathleen H. McClaskey, President of Ed Tech Associates, is a recognized UDL and Digital Learning Consultant with 28 years experience in using technology in the classroom. 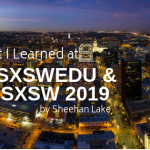 Kathleen is a frequent international, national and regional workshop presenter on topics that include Universal Design for Learning, Technology for Diverse Learners, Math and Technology: Bringing Research to Practice and Built in Moodle. In 2007, she was awarded a three-year NH Math and Science Partnership grant for the “Science4All” project, applying UDL principles in the science classroom. In 2009, Kathleen designed and directed the Tools for Learning Math Intervention Project where tools were applied to UDL researched-based instruction in math. 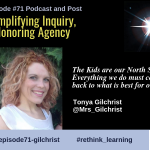 In late 2009, she became the professional development director of three ARRA technology funded projects in NH to create 21st Century Classrooms. In all of these projects, Kathleen developed a UDL lesson design structure for project teachers to support the learning of all students. Every child is born curious. You may remember the saying “the world is your oyster.” A child takes that oyster and tries to figure out how to open it. As soon as we can ask questions, we do. We ask why this and why that. The questions are more important than the answers. How do we bring curiosity back to schools? For so long schools have killed creativity and squashed curiosity. Students are fed information and then tested on it and then labeled from the test results. The system isn’t working and needs to change now. Finland realized this in the 1980s. They were testing and teaching to prescribed standards by grade level. They realized their system was mediocre and were creating a population of people who did not know how to think on their own. So they changed everything. They threw out the tests and changed teaching so it became the most valued profession. Teachers compete to get into the teaching masters two year program. If they are accepted to become a teacher in Finland, they attend for free — and they work very hard. They then intern in a teaching hospital where they are given a mentor and students as part of a lab. The teacher matters. Students matter and learning is different. Learning is personalized. Improving teacher recruitment and training at colleges of education. Offering a high-quality curriculum with pathways to high-quality vocational training at younger grades. 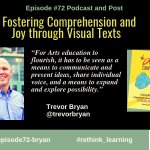 Emphasizing play and the arts in education. How does Finland bring back curiosity and creativity to learning? They encourage questions. The teacher allows students to drive their learning. In doing this, the teacher’s role changes. Can this happen in the US? I am seeing pockets of change with charter schools and a teacher here and there. However, we are still working within a system of prescribed curriculum, teaching to the test, and standards at each grade level. It’s amazing that Finland did start over, and it worked, but Finland is as large as the state of Texas. They are a diverse nation with multiple cultures but not like the US. Each state in our nation is different. Each state has their own standards even though most adopted the Common Core Standards. Changing teaching and learning in the US is going to take lots of time because everyone involved has their own preconceived ideas of what teaching and learning should look like. 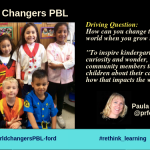 I am going to keep doing research on how to personalize learning, what personalized learning is, and find models and examples to share with you. I welcome any comments, research, or links to help me on my quest. The problem with “kind of” listening is that it can lead to mistakes, misunderstandings, the wrong goals, wasting time and lack of teamwork. As a coach, I learned the importance of careful and thoughtful listening. Yet, I still have to remind myself about active listening. Some people think they are listening but to build relationships that work, they need to listen well. They may be listening just enough to jump in to say what they want to say. Some have trouble concentrating on what the other person is saying so they zone out or daydream while the person is talking. There are others who think they are listening but actually are thinking of all the things they need to do that day. Yet, listening is less important than how you listen. By listening in a way that demonstrates understanding and respect, you build a true foundation for a good relationship no matter if it is between coach and coachee, teacher and students, friends, mother and child, spouses, or team members. Respond with Interest: While you are listening, you can give both verbal and nonverbal responses such as nodding, smiling, and comment to the other person(s). You can demonstrate you received the message and how it had an impact on you. When you respond, speak at the same energy level as the other person. This will help the person who is speaking that they really got through to you and will not have to repeat what they said. Be Respectful: Let them know you take their views and ideas seriously. Be willing to communicate with others at their level of understanding and attitude by adjusting your tone of voice, rate of speech and choice of words to show that you are empathetic and trying to imagine being where they are at the moment. What is interesting is that teaching is now a second or third career for even retirees according to this article in the NY Times. Walt Patterson who is 65 who had been a local school board member, heard about an opening at the nearby West High School to teach science, and decided to build on his science and math background to become a teacher. “My wife told me she wasn’t going to keep working while I went out every day to play golf,” Mr. Patteson said. After 10 years in the Navy, where he was a pilot, he returned home to help run his family’s farm in Tracy, Calif. But two decades later, in 1999, when the farm was sold, he was only 53 and he wanted to do something community minded. All over the Internet there is talk about baby boomers leaving in droves and leaving a teacher shortage. This means there could be an expanding economy. If teachers retire, they leave with a pension and have time to enjoy themselves and spend some of their money on themselves. Money that goes back into the economy. This means that if you are interested in being a teacher, this is the time to jump in. Especially if you have a math or science background, you will be in demand in a few years. Take some classes. Learn about how technology will play a big part in a classroom and online environment. Things are changing. Jobs are coming. And if you’re retiring and want to work, look at teaching and sharing your vast knowledge you have attained.